We liked the sheer versatility that this shed offers. Whilst it may not be the deepest, its clever design makes it very easy to move objects in and out. This is further enabled by the wide opening, and tall, double doors which slide easily apart with a mechanism that is hidden internally. There is also an integrated ramp so that you can easily use a trolley or wheelbarrow to transport goods to and from this shed. There are no windows on this shed, which is in itself a useful security feature on a storage shed such as this, but it makes sense to have a torch inside the shed. Alternatively, there is the option to add a skylight to allow natural light in. When inside however, the atmosphere is pleasant, thanks to the generous ventilation provided on the gables. If storing anything valuable inside, you’ll need to purchase a padlock separately. Weather protection is very important in our current climate, and the apex roof is the first line of defence against rain and snow. The galvanised cladding used for the walls, roof, gables and frame also offer excellent protection against the elements, and are the reason why the manufacturer is able to offer a long 20 year guarantee against perforation damage caused by rust. The most noticeable about this shed is its comparative width and height compared to its depth, giving it a reverse apex effect. We like the fact that this makes it eminently suitable for people who are looking for a significant storage space, yet don’t have long gardens. The other thing that struck us on first sight was the dark green colour scheme, nicely complemented by cream doors, roof and gables. It’s painted with two coats inside and out, and the finish seemed tough and even. The apex nature of the roof helps water run away, and adds extra space for standing in or for storing tall items. At its peak, the roof has a height of 1.93m, backed up by an eaves height of 1.78m. 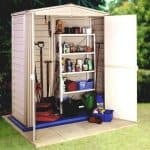 The overall width of the shed is 1.71m, and the overall depth is 1.13m, although there is also an overhang. Once assembled, we were impressed by how sturdy the shed felt. Some metal sheds can seem a little on the flimsy side, but the strength of this one is enhanced by the hot dipped galvanisation to which the base steel has been subjected. This gives greater strength to the cladding, as well as giving it extra protection against rust that could otherwise be caused by rain. We were also pleased to see that the metal frame was made of thicker galvanised steel, adding to its toughness. There is no floor as standard, but the owner has the option of erecting it directly onto a flat area of concrete, measuring at least 1.71 X 1.13m, or adding a timber floor. Whichever option is chosen, the customer will need to acquire the necessary kit as an extra purchase. Being made of metal, there are no treatment requirements for this shed which will be welcomed by those who are used to timber sheds. 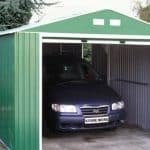 What we particularly welcomed is the 20 year warranty provided by the manufacturer, which is twice as long as the warranties found on some similar metal sheds. This warranty covers the shed against perforations resulting from rust. We were pleased with the size of the double sliding doors, which dominate the front of this shed, and that they are fitted internally giving them extra protection. They have a width of 0.69m and a height of 1.70m. We found that this makes it very easy to get tools and equipment in and out, particularly as there is a strong entrance and exit ramp included as standard. This ramp covers the full width of the shed, and felt reassuringly strong under our feet. This shed doesn’t have any windows, but natural light reaches every corner when the doors are opened, and there is more than adequate ventilation provided by openings on the gable. Because it’s so easy to store things in this shed, we would have liked to see the added security that is offered by a padlock. There are, however, holes in the handles so that a padlock can easily be fitted if purchased separately. Another handy security feature is resultant from the lack of windows around the perimeter, preventing potential thieves from seeing what’s stored inside the shed. This in itself can often act as a deterrent, particularly as the internal fitting of the door also makes unauthorised access more difficult. We like the simplicity and ease of assembly that comes from affixing a metal shed directly onto level concrete, but to do this a set of screws will need to be acquired. As an alternative, a timber floor kit can be purchased. This contains everything needed to be able to insert a wooden floor, including all fixtures and fittings. There is also the option to add a skylight to this shed, which is a nice touch for customers who will be spending a little more time in the shed. Whilst retaining privacy, it allows natural light to illuminate the shed even when the doors are closed. Shed Baron have an excellent reputation for the quality of their components, and we found evidence of this throughout the shed, from the paintwork to the cladding beneath it. 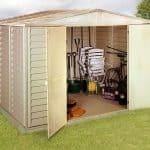 For a shed that costs not much more than two hundred pounds, we were pleasantly surprised to see a 20 year warranty offered. This demonstrates how long lasting the components are. The apex roof adds a little extra space, which is always handy in a compact shed, and the eaves and doorway are both higher than we often see in similar sheds. Whilst full instructions are included, they could have been a little easier to follow, especially as many components look the same. You and a friend can expect to have it fully installed in approximately four hours. 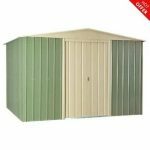 This is excellent value for a shed backed by a 20 year warranty against perforations caused by rust, although extras such as a skylight or timber floor kit will push the initial price up. 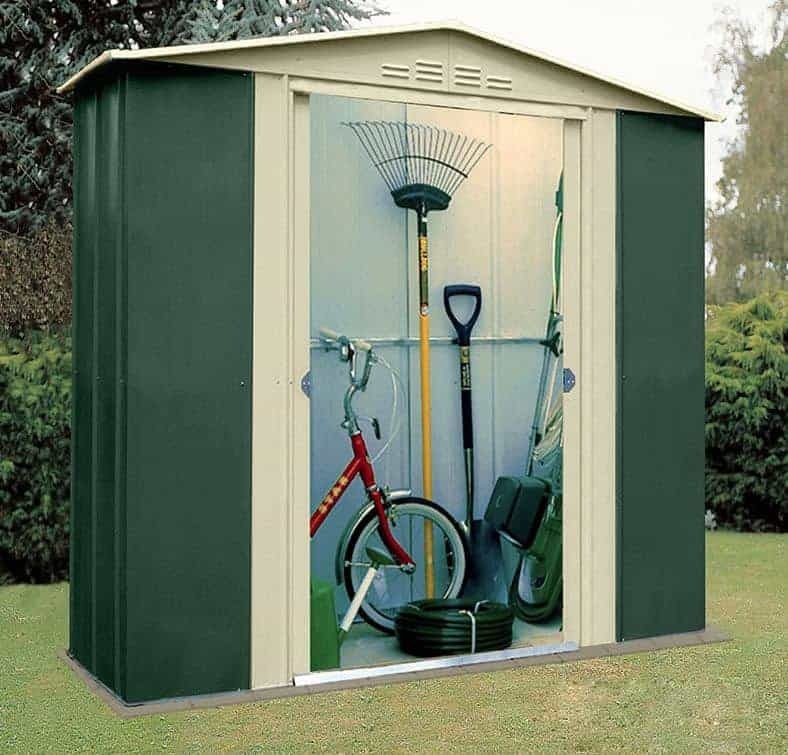 Final Thoughts: We liked both the look of this metal shed, the green and cream makes a pleasant change from metallic silvers, and its performance. 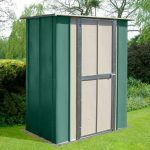 The wide and tall sliding doors and the strong entrance ramp both make it very easy to get even large or heavy objects inside, making this a good choice for a budget priced storage shed. If using it for this purpose, however, you will want to add a padlock and possibly an alarm. Excellent weather protection is provided by both the roof and the cladding, so you won’t have to worry about rain getting to whatever’s kept inside.